Alexander Dennis Limited has broken through to mainland Europe, with the delivery of 20 Plaxton Elitei coaches to PolskiBus.com, the intercity express coach company launched in June 2011 by Souter Holdings. The company offers comfortable and inexpensive coach travel across Poland and extending to the capital cities of adjacent countries, Berlin, Bratislava, Prague and Vienna. The Plaxton Elitei delivery will increase the fleet to 132 vehicles, as part of a PLN 35 000 000 (£6.7m) investment in the expansion of services. A further two Polish cities and the Lithuanian capital, Vilnius are included in new routes and the frequency of four existing routes has been increased. Since its launch three years ago, PolskiBus.com has experienced continued growth, carrying more than 8 million passengers. Much of its popularity is due to the fact that prices start from 1PLN (Polish Zloty, approximately 20 pence) plus a 1PLN booking fee when pre-booked. This is much the same concept as Megabus.com offers across the UK and parts of Europe. The growth of the company has created 730 new jobs, and the new services mean they will soon operate more than 300 journeys a day reaching 22 Polish cities and six European capitals. PolskiBus.com are the first company in Poland to operate the 15m Plaxton Elitei, which was launched in the UK in 2012 and features in the Megabus fleet amongst others. They are built on a Volvo B11RT tri-axle chassis with a Volvo 10.8litre Euro5, 430bhp engine, driving through Volvo’s I-Shift transmission. The Elitei is available in both left and right hand steering options and it is claimed that the 12% chromium stainless steel structure offers a major saving in weight over comparable products constructed from mild steel. Depending on specification, the Elitei can be up to 10% lighter than many comparable vehicles offering huge potential benefits in payload and fuel economy. The high deck vehicles are designed to be suitable for those with mobility problems or requiring smooth wheelchair access. Entrance is gained through powered, wide opening, twin leaf doors to the lower deck, which can accommodate a wheelchair and three seated passengers, or be used as seating for four. 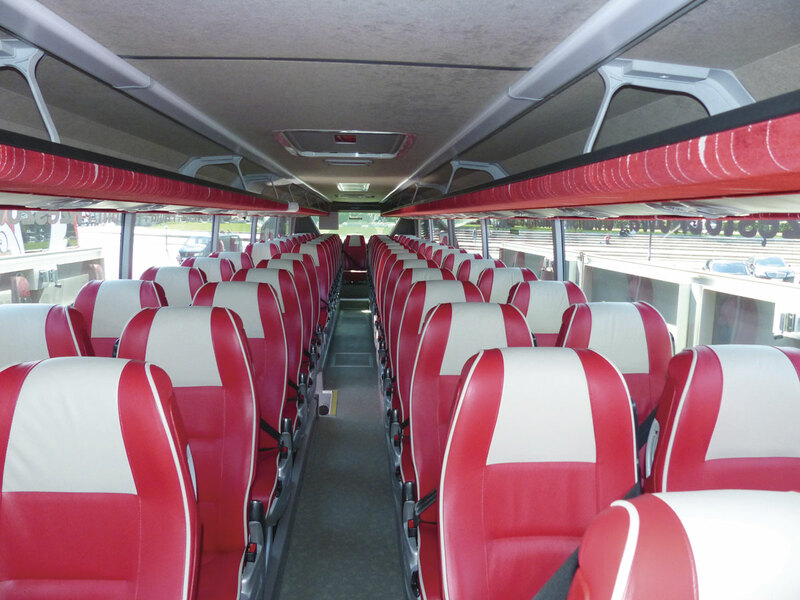 The upper deck seats 71 and all of the Gala 970 seats are reclining, with two-tone red and cream leather upholstery and three point fitted safety belts. Sockets for charging laptops and hand held devices are located under each seat. Above them are individual lights and adjustable outputs for the Thermo King X900 air-conditioning. Free wi-fi is available and an audio and visual entertainment system is also provided, ideal for those passengers on longer journeys, as is the on-board toilet! Much of the interior is bespoke to PolskiBus.com, including the seat trim and side casings and the overall effect is one of modern comfort. Prior to its acquisition by ADL in 2007, Plaxton was building approximately 200 coaches and a number of midi buses per year. They are expecting to build in the region of 250 coaches and 800 buses at their Scarborough site this year.